Sirus, a German shepherd, showed extraordinary loyalty and love in protecting his human companions by offering up his own life in the face of armed intruders. One early morning in February 2010, when everyone in the family was sleeping, attentive Sirus sensed intruders approaching outside his home in the city of Kelloggsville, Ohio, USA. Barking persistently at the door, he was eventually let out by his caregiver Michael Hommes Jr., who was unaware of the impending danger. Rushing outside without a thought for his own safety, Sirus immediately confronted the intruders. Even a shot in the nose did not stop him, and he was injured further by a second bullet from a bigger gun. His courageous action had won precious time for his human companions, allowing Michael to equip himself and join Sirus’ brave defense efforts, while his fiancée Michelle Pryor, took their 8-week-old baby to the back of the house out of harm’s way. After the intruders fled the house, Sirus was rushed to the vet and miraculously survived the two serious bullet wounds. 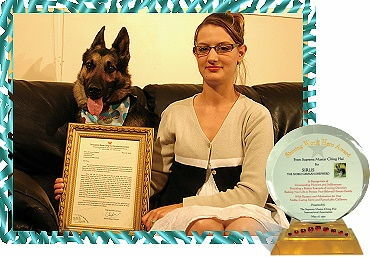 On hearing Sirus’ touching story, Supreme Master Ching Hai granted him with the Shining World Hero Award and US$500 toward his veterinary treatment. 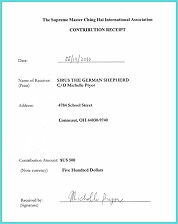 The Award and the monetary gift were presented to Michael and Michelle on June 13 by our Association members from Ohio Center. They also brought some delicious vegan dog food, which Sirus really seemed to enjoy, plus a Hero jacket made especially for him. We join in a heartfelt salute to loyal Sirus for his heroic actions as we wish him a swift recuperation to health. We thank him for being human’s best friend, for showing us the unity among all beings with his noble deed and selfless love which surely inspire us all.